Unfortunately, dogs and porcupines sometimes meet with terrible results. Quills are commonly embedded in a dog’s mouth, on its head, its neck and sometimes on other parts of the body such as shoulders or sides. Quills have tiny, little one-way barbs along their shafts which enable them to migrate easily through the skin and muscle into a pet’s body. 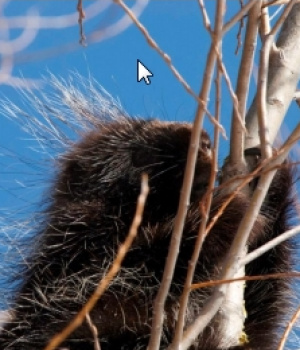 Porcupines appear to have long strands of brown hair that looks soft, but underneath this hair are thousands of quills; approximately 30,000 quills cover the porcupine’s, head, neck and rump. These quills are a very effective defense mechanism for the porcupine, which is short-sighted, slow-moving and not known to be an aggressive animal. Porcupines do not ‘throw’ their quills. When stressed, the porcupine’s muscles tighten and the quills ‘emerge’. When confronted with a predator, the porcupine quills emerge and the porcupine will present its rear quarters and quilled tail to its adversary. The quills are easily dislodged from the porcupine’s body and become easily embed into the surprised dog’s mouth or other area. Quills are best removed by a veterinarian, under anesthesia/sedation, not only to lessen the discomfort of quill removal but also to decrease the likelihood of quill breakage. Broken quills can still migrate into the dog’s body, which can result in serious infections or damage to internal organs. Quills are also more easily palpated on an anesthetized/sedated dog which facilitates their removal. Even after quill removal, one must remember that there may have been broken quills already embedded in muscle which could not be palpated or removed. A dog’s owner will therefore need to be diligent in watching for signs of remaining quills. This can be accomplished by examining/feeling all areas of the pet’s body and watching for signs of infection, i.e. swelling, discomfort, lethargy, etc. If you have any questions or concerns about your pet come directly to The Veterinary Emergency Clinic of York Region. We never close. We’re open 24/7/365. Appointments never needed.